Can you believe we are actually here? Summer! One of Canadas most cherished times! Along with summer we associate many things. Camping, swimming, fishing, canoeing, blah blah blah…lets get real here! We love these activities, but, we LOVE the main ingredient that makes all of these things amazing: THE SUN! In turn, we are proposing what makes us feel free as we reacquaint ourselves in form of style and hair. It’s all about being comfortable with our natural beauty and feeling free. This is where our Spring Summer 17’ trends stem from. We will be proposing a series of fun and wearable looks within our collection this year. Referencing reliable sources but most of all the looks coming from our own creative ideas. Let’s will jump right into the fun! Showing off that pink & lavender pastel! The wonderful thing about pastel colours is that they give your skin tone the immediate illusion of a tan. Just think about why people go lighter. The visual of a blonde with no gold tones in will suite almost every skin tone. Add a muted colour (pastel) to this and you are generally still a high lift blonde looking like you just got back from a quick 3 day getaway in the Bahamas. Our first model (Emily) is what hair colourists consider a rare gem. This means that she has natural virgin hair and has never coloured it! Since we are working with such a great palette (Natural level 6-7) we had the opportunity to create pastel colours. 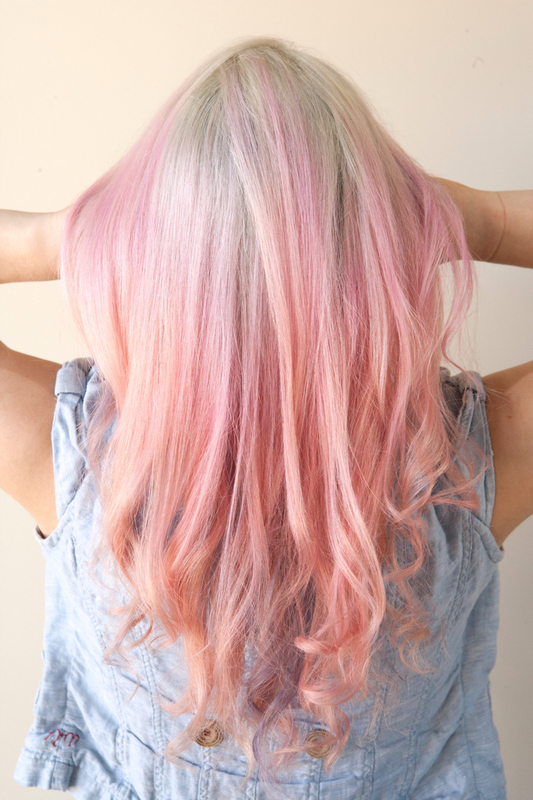 The pastels formed from a silver shadow root and went into a pink and lavender. To achieve this we had to lighten Emily’s hair as light as we could past a pale yellow. 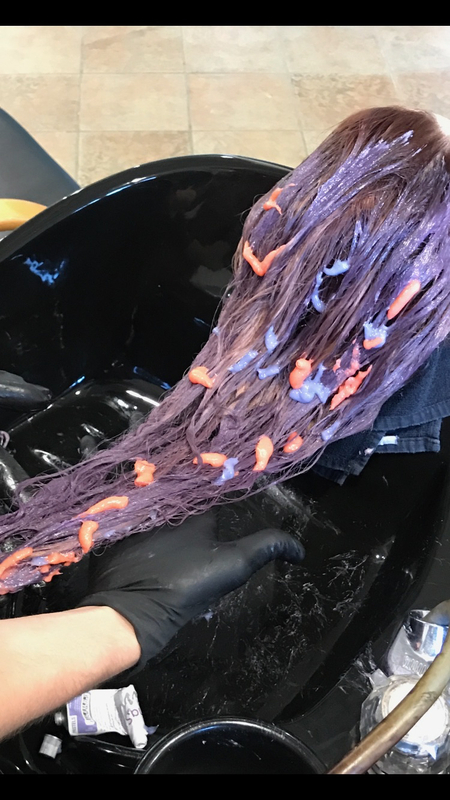 As you can see in the pictures we created the shadow root first and then applied our pastel using a balayage technique. 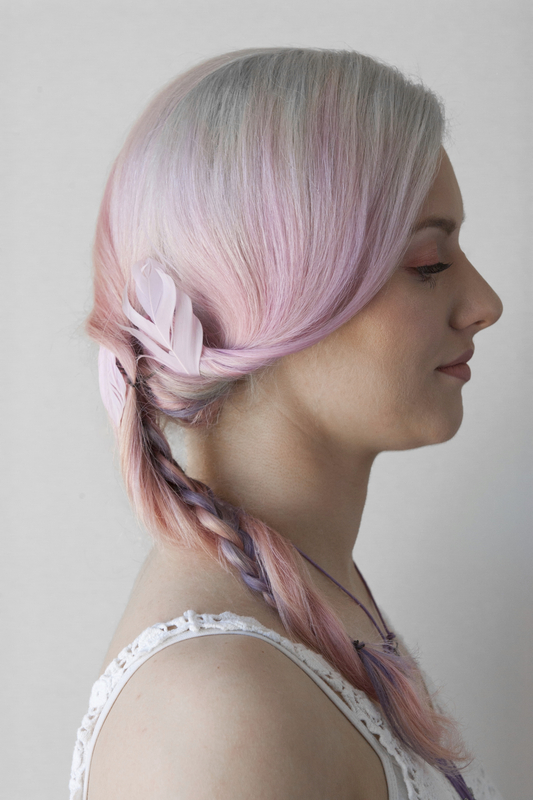 The pastel lavender was placed around the nape area so that when she braids her hair both pastel colours will intertwine with each other and create a boho meets fantasy look. There are endless ways of showing off these colours. 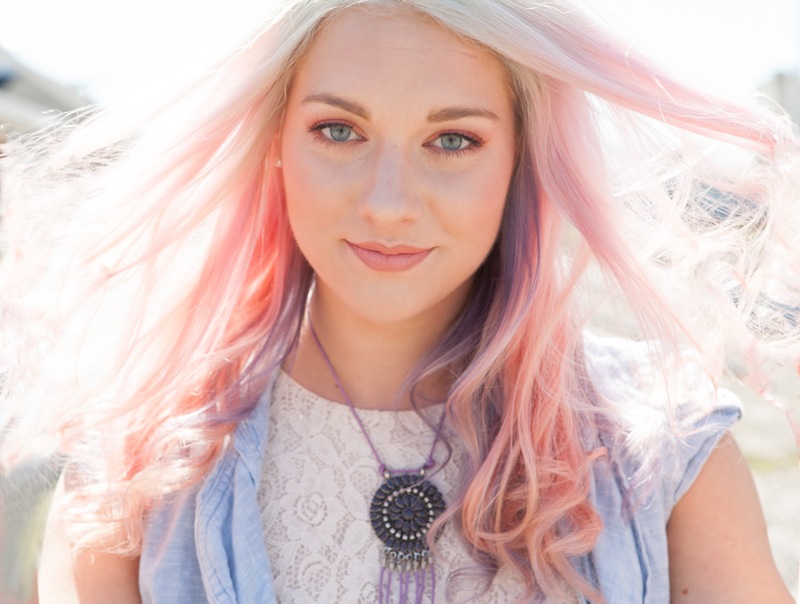 Soft waves so the lavender can peek through, straight, so you can see the seamless blend of the shadow root. Here is our SS17 Collection in photos! Enjoy! We live for the summer! 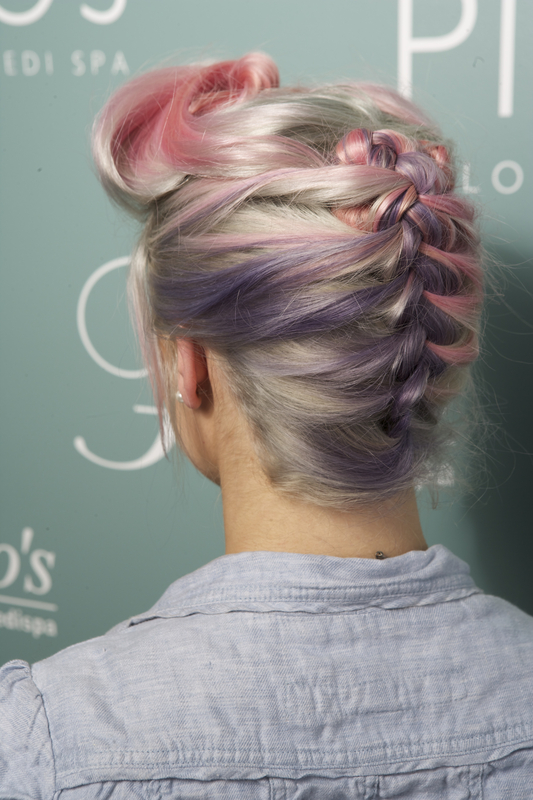 Look created by myself (Bruno) I wanted to show off the balayage with the swoop tucking into the nape area and intertwining the lavender into a braid. 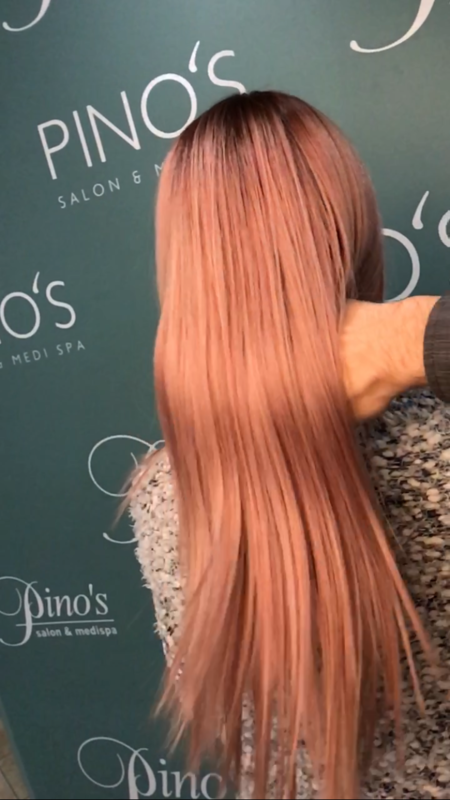 Ever dream of rose gold hair? It’s been a while since we’ve posted any colour transformations lately. So I thought we should go for a big one! This picture below shows Magdalena and her dark mahogany violet hair. We wanted to go for a shadow root or balayage concept for easy maintenance. This technique would make it easy for colour touch-ups until the blend grows farther down and is needed to get painted up again. It took us a while but we got it!!! Magdalena has fair skin with warm tones so we decided to keep the colour quite warm still. 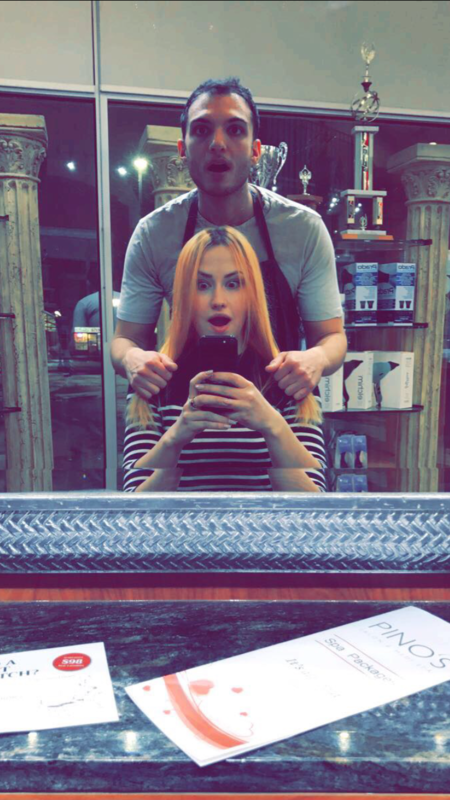 Rose gold hair is perfect for her! I’ve always pictured her as a blonde, therefore, anything lighter than her natural (light ash brown) would suit her AND compliment her skin tone. We decided on a rose gold with a metallic reflexes so that the colour would shimmer in bright lights. 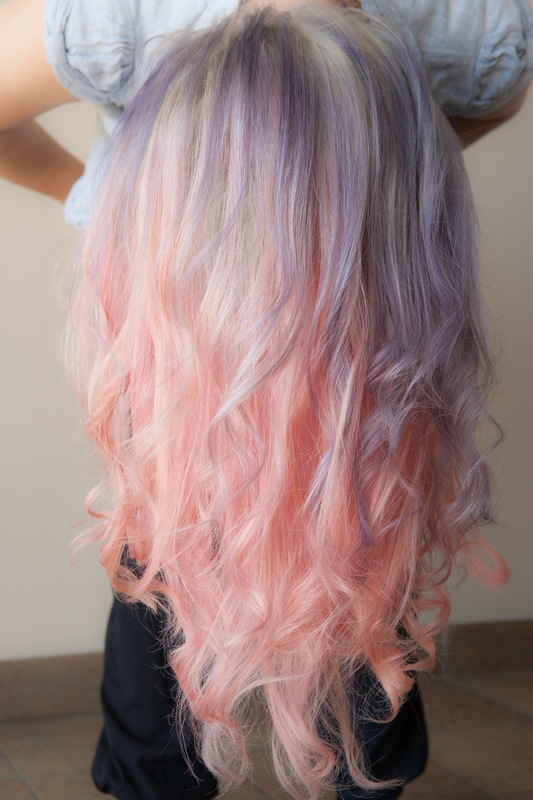 In order to achieve something like this you need to take out almost all of the warmth and bring it to a light blonde. The lighter we lift, the more of the metallic reflex will be shown. With an opportunity like this transformation I decided to use Olaplex formula to protects Magdalenas’s hair. Olaplex is known amongst the hair industry as the catalyst of healthy hair during a drastic colour change. In other words, your hair won’t be on the ground after you achieve your six level lightening jump. We add this product within our lightener to keep the hair bonds strong. It also comes with a treatment mask to rebuild the internal strengthening bonds of the hair. 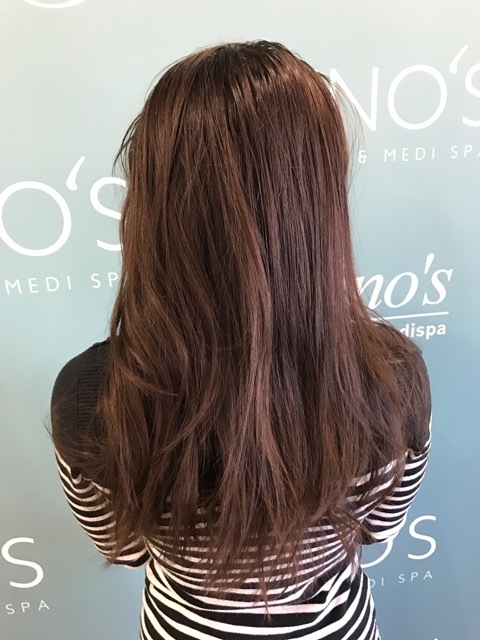 If you are interested in doing a change like this or any type of drastic change then call in and book a consultation with us so we can create a game plan! Toning Magda’s hair was just too much fun! I used Maraes colour from Karaal to get the shadow root and for the rose gold I used a combination of Maraes and Pravana. I prepared half of the Pastel Lavender and Pastel Coral. There are millions of dollars that are put towards the research for anti-hair loss each year but it just seams like genetics has a stronger hold on how you can keep or lose whats on your head. Scientists took biopsies of 14 scalps in the early stages of hair loss and then exposed them to solutions of different levels of caffeine. 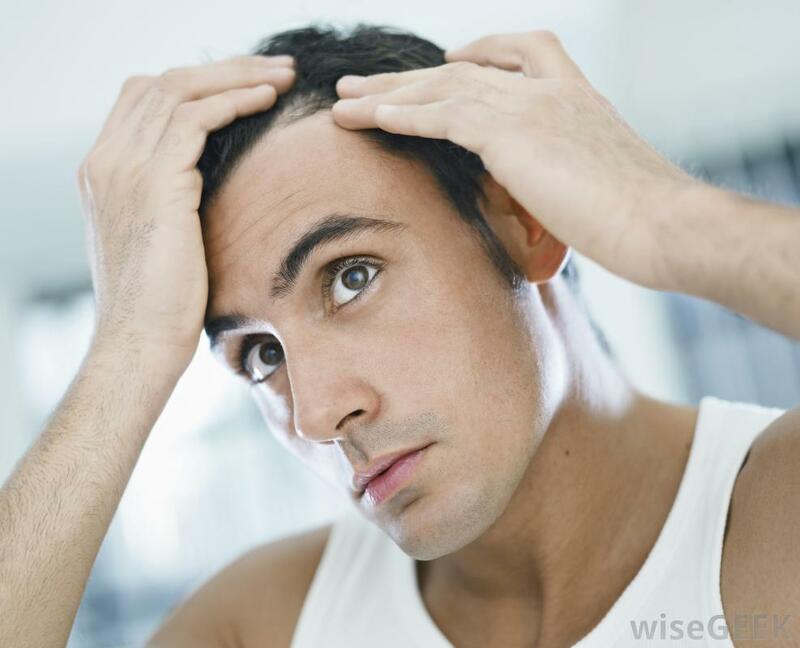 They also exposed some of the follicles to DHT (the hormone responsible for hair loss). After 8 days, even the hair follicles exposed to the DHT showed growth. They also found that it was greatest in follicles that were placed in solutions of caffeine only. Now, based on that solution, drinking any form of caffeine would take you up to 60 cups a day. This is about 6000mg of caffeine, which might regrow your hair after your heart stops—definitely not the safest solution but it is comforting to know this helps to some extent. 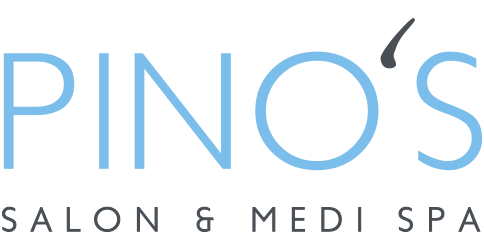 Looking to be gone with aging and hyper pigmentation? Created in Texas, EltaMD is a small but superior sun protection line, designed with maximum efficacy in mind. Best of all, EltaMD can be used on each and every skin type, and even on children! Specially formulated with zinc oxide, EltaMD provides long-lasting UVB and UVA protection. Finding a sunscreen that protects from both wavelengths is important when choosing how best to protect yourself. Most people are satisfied with picking up the typical drugstore brand of sunscreen before going away, however it’s important to know what you’re getting before you throw your money away on a product that is going to leave you looking like a lobster! Here’s what you need to know! UVB rays superficially penetrate the outer layer of your skin. This can lead to premature aging, environmentally damaged skin and the development of skin cancer whereas UVA rays penetrate deep into the dermis, the skin’s thickest layer, causing major damage over time and damage. This will lurk about the deepest layers until the aging process leads to further development of cancerous cells. UVA rays penetrate deeply into the skins layers, damaging collagen and cells which lead to wrinkling, hyperpigmentation and loss of elasticity. This is key with preventing aging and hyperpigmentation. How do you know which SPF rating to choose? Firstly, you need to know that SPF stands for sun protection factor. This refers to their ability to deflect UVB rays. Without having the outer layer of your skin protected you are leaving the under layers vulnerable to attacks from the sun! Using a product with an SPF 15 or higher limits your chances of developing skin cancer. It also halts premature aging and hyperpigmentation caused by the sun. EltaMD believes that proper sun protection is essential for every individual, which is why they make their products easy to use, with light, creamy, non-comedogenic lotions and creams. We have unlocked the pore truth! Have you ever spent an entire morning makeup-session staring at your reflection wondering why your pores have begun to take over your face? Well, it’s not that you’ve developed a whole slew of new pores, or more have come out from their hiding places. Your skin care regime just needs a little tweaking. For those who aren’t aware a pore is a route or a channel by which the skin’s surface can be reached. Pores house a hair follicle and sebaceous gland and serves as a gateway for sebum. The sebum is our skin’s natural oil. While many people believe you can get rid of pores, this is simply a myth. The truth is that you cannot banish them completely, but with the right skin care, you can make pores look less noticeable. You can make pores appear smaller by removing the excess sebum, debris, and makeup that has built up within them. Oil sitting at the mouth of a pore also contributes to the problem of large pores given that the oil may reflect light which would make the openings once again appear larger than they really are. How do we develop pores you ask? Pore size is largely determined by genetics. Although, poor hygiene and its resulting dirt and oil and the dead skin cells that lurk about underneath the surface of your skin. This can contribute to making pores look much larger. If a pore becomes clogged, it is stretched temporarily and it will in turn become more apparent. So when your esthetician tells you to make sure you’re taking care of your skin at home, listen to her, she’s trying to save you from large pores! Aging and sun damage also contribute to pore size; the skin around a pore loses its firmness when we age and the pore may appear larger due to the lack of support from the surrounding tissue. 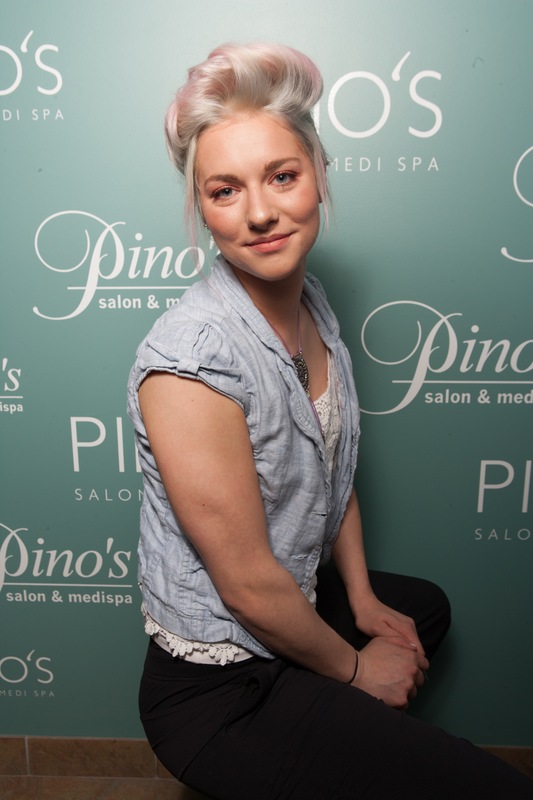 The pore truth is getting regular facials is of key importance if you are trying to keep your pore size at bay simply because the esthetician will do extractions which will help to clear the debris that has built up over time. Another myth that tends to surround pore size involves steaming them. Contrary to popular belief, pores cannot ‘open and close’ with steaming; this is because pores do not have muscles around their openings. Steaming instead, helps to loosen underlying debris, which makes for easier extractions. We can therefore see that although annoying, pores are an essential part of our facial structure and having a route for our natural oil to derive from is of the upmost importance. It’s all about managing them to make sure they look their best! That is the pore truth!